A June 26 Current Affairs article must be the most pro-sortition editorial to appear in mainstream media in recent history. More importantly, it oozes with wit that justifiably pillories America’s “intolerable” Congress. The arguments here are familiar but are combined in an unforgettably entertaining way. It begins with the sad shape of Congress. The data confirm that Congresspeople have a lower approval rating than marketing executives and bubonic plague. Second, it points out that Congress is not “representative” in the demographic sense. It then moves on to the evidence that “representation of interests” is a fantasy, citing Gilens and Page. If your Congressman (or Congresswoman, but probably Congressman) puts forward the kinds of policies that you yourself would wish to see advanced, why does it matter whether you and he happen to have wildly different backgrounds? That would be an excellent argument, if Congress usually put forward policies that Americans agree with. Alas, it does not. One Princeton study estimates that, statistically speaking, the preferences of 90% of the American electorate have a “near-zero” impact on policymaking. And a number of highly-publicized legal reforms with a broad popular mandate, such as closing the gun show loophole, have never made it anywhere near the President’s desk. How is that possible in a “representative” Congress? Lastly, it debunks the myth that elections “select for the better” and suggests that elections actually “select for the worst,” an argument that many including Manuel Arriaga have made. Inevitably, elections will disproportionately select those who most want to win them, and the people who most want to win elections are disproportionately likely to be venal and self-serving. It is an ancient cliché that those who want power are the least suited to have it. Just think about the people you know in your daily life, the ones who enjoy being the first to speak at meetings, and willingly make decisions on behalf of the group. Most of these people are awful. It ends with, perhaps an overly-elaborate, metaphor of a candy-sorting machine (electoral mechanism) gone awry. An election is supposed to be an elaborate sorting mechanism to filter out the best and most sumptuous chocolates/congresspeople. Instead, it belches out a toxic slurry. Better to just fling away the choosing-machine and pick around at random. 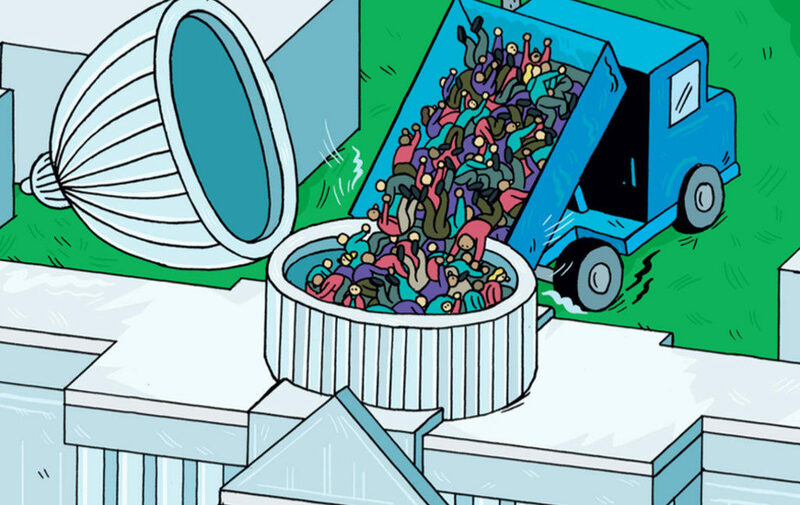 Nobody is suggesting that randomly-selected citizens would make especially capable congresspeople. (Nobody, after all, suggests that randomly-selected citizen jurors make especially capable arbiters of forensic evidence, but we let them do it anyway.) The only question is: could it possibly be worse? We posit that it could not. It seems to me that this most embarrassing moment in American political history is a promising one for genuine democracy in the legislature, for sortition. If nothing else, it is now on the radar screen of public discourse and will be taken more seriously given the joke of a system we now suffer. One thing is certain: Rational argument alone can hardly transform a world-view–wake anyone up from the collective “electoral fantasy”–but comedy can and often does such things. P.S. What’s missing from this story, and just about all accounts of “participative democracy” I have seen, is what would such a citizen-led institution do conceptually, practically, and affectively to the way politics is lived, felt, and conceived. Also, what modality should such citizen assemblies or panels have in order to do something that is not only less corrupt, but actually more effective than what now is supposed to pass for “deliberation.” My hope is to get into these issues in the near future. O dear, must we recycle this simplistic nonsense? As Peter Stone put it when he originally posted this on the Facebook page: “a particularly smug and annoying defense of sortition”. Comedy is a useful tool when you want to score cheap points, but does nothing to advance the serious case for sortition (especially when it is posted in a context that ridicules the choice of nearly half the US electorate). Whatever positive effect the article’s writing might have had, the illustration for me sparks an eerie sense of Fee-Fi-Fo-Fum. Don’t shoot the messenger, it was Peter Stone’s nonsense that I was recycling — credit where credit is due. I’ll leave it to you to decide which of your long list of adjectives you wish to apply to his comment (I think you originally described it as “disappointing”). Keith, imho, you and Stone are more rational than most humans. I’m happily more average here. In any case, what do you expect an article introducing something entirely new to do in under 1000 words? This “simplistic” arg is actually a rough summary of the kernel of why elections don’t work and why campaign finance would not fix the issue. Agreed, graphic illustration is not the best. The dispute is over whether sortition should replace or supplement election. Those in the former camp argue that elected politicians will only hand over power when forced to (by popular demand), so the task is purely one of consciousness raising. Those of us in the latter camp (including Peter and myself) disagree that elections “don’t work”, arguing instead that the democratic process can be improved by introducing sortition alongside election. But this requires serious analytic and experimental work, not slogans and jokes. And it doesn’t help to alienate those we are seeking to influence (political scientists and elected statespersons) by publishing books entitled “The End of Politicians” and the likes. Sutherland, attributing your own faults to others is another one of your disgusting character failures. I’m agnostic on replacement versus supplement, especially given how early we are in the game. The kernel is that Sortition does some things right that elections do perversely wrong. Once this becomes “commonsense,” we can move on to concrete proposals and counterproposals. If you don’t take advantage of their record low approval rate and make fun of the “bozos,” you’re missing a chance to connect with a wider audience. They are indeed bozos in so far as they have all the incentives to do a crappy, counterproductive work and few to do what they were entrusted with–even leaving aside radical critiques for the moment. The article doesn’t blame the elected for being stupid, but for being self-serving. This is a much more accurate and painful accusation. In this sense, as well as in others, this is a pretty well argued piece. If the electorate are self-serving (rather than rationally ignorant) then why would a randomly-selected sample of the same demos be any better? As I have pointed out many times, the allotted would be self-serving, but their world view and interests would be aligned with those of the public, unlike those of the electoral elite. That is not correct. There are many more options than these two. We must remain aware there are many ways in which sortition could be applied. Therefore, the electorate should chose by election which party with which practical system of sortition gets more power. We can expect rapid innovation and improvements once sortition models start to take off. So citizens must be able to chose (by election). By logic, as long as any given sortition process may benefit from further improvements and given that progress never stops, sortition should never replace election at all.